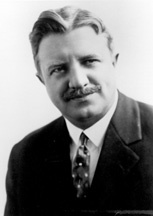 DILL, Clarence Cleveland, a Representative and a Senator from Washington; born near Fredericktown, Knox County, Ohio, September 21, 1884; attended the public schools; engaged in teaching 1901-1903; graduated from Ohio Wesleyan University, Delaware, Ohio, 1907; newspaper reporter in Cleveland, Ohio, in 1907; taught in the high schools at Dubuque, Iowa, 1907-1908, and in Spokane, Wash., 1908-1910; studied law; admitted to the bar in 1910 and commenced practice in Spokane, Wash.; deputy prosecuting attorney of Spokane County 1911-1913; private secretary to the governor 1913; elected as a Democrat to the Sixty-fourth Congress; reelected to the Sixty-fifth Congress (March 4, 1915-March 3, 1919); chair, Committee on Mileage (Sixty-fifth Congress); unsuccessful candidate for reelection in 1918; resumed the practice of law in Spokane, Wash.; elected as a Democrat to the United States Senate in 1922; reelected in 1928 and served from March 4, 1923, to January 3, 1935; was not a candidate for renomination in 1934; chair, Committee on Interstate Commerce (Seventy-third Congress); engaged in the practice of law in Washington, D.C., and Spokane, Wash., 1935-1939; unsuccessful candidate for Governor in 1940; unsuccessful candidate for election in 1942 to the Seventy-eighth Congress; member of the Columbia Basin Commission of the State of Washington 1945-1948; special assistant to the United States Attorney General 1946-1953; resumed the practice of law in Spokane, Wash., where he died January 14, 1978; interment in Fairmont Memorial Park. Oral History: 1964 and 1971. 39 pages and 26 pages. Papers: 1913-1970. 15 feet. Correspondence (1953-1975) relating to law practice, typescripts of speeches (1916-1972); manuscripts of published and unpublished books, including autobiography entitled Where Water Falls (1970); documents and ephemera concerning Grand Coulee Dam and other power projects; and family and personal papers. Topics include public broadcasting, taxation, and Indian affairs. Finding aid. Papers: 2 items (1911, 1916) in the Beverly Clarke Mosby papers. Oral History: December 13, 1967. 19 pages. Available on interlibrary loan. Index. Copyrighted material that may not be copied in its entirety. Papers: Correspondence in James M. Geraghty papers, 1916-1932; Walter B. Beals papers, 1916-1951; Guy C. Myers papers, 1926-1960; Merrill & Ring Lumber Company records, 1888-1956; Mark Allison Matthews papers, 1884-1948; and William E. Humphrey papers, 1903-1934, on 2 microfilm reels of originals in various collections. Papers: Miscellaneous papers in various collections including Clarence Daniel Martin papers, 1896-1954. Finding aid. Dill, Clarence Cleveland. How Congress Makes Laws. Washington: Ransdell, 1936. ___. Radio Law, Practice and Procedure. Washington: National Law Book Co., 1938. ___. Where Water Falls. Spokane: n. p., 1970. Irish, Kerry E. "Clarence Dill: The Life of a Western Politician." Ph.D. dissertation, University of Washington, 1994. Irish, Kerry E. Clarence C. Dill: The Life and Times of a Western Politician. Pullman, Wash.: Washington State University Press, 2000.